I’ve never been a terribly possessive person. In fact, my family gets pretty nervous whenever I start cleaning. However recently I became aware of how much a particular item meant to me. To whit: my coffee mug. 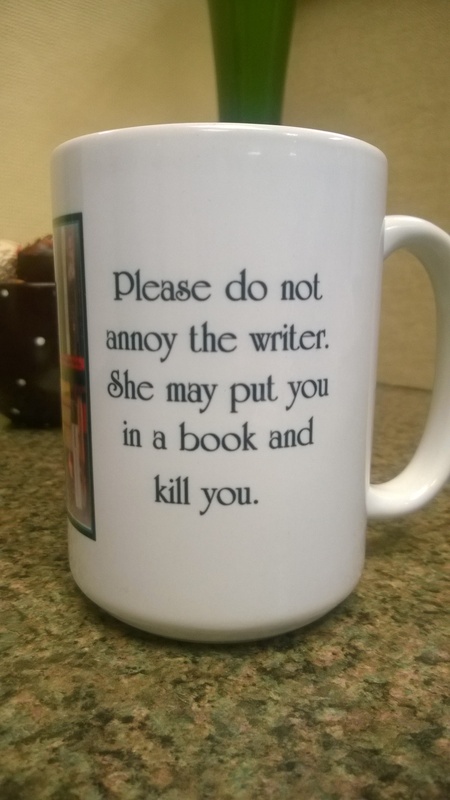 Or rather, my tea mug. For I drink tea in it. I inadvertently left it in the staff break room earlier in the week. When I returned, it wasn’t there! Someone must have stolen it! For surely, it was such a glorious mug — everyone must have coveted it! Oh gawd, my mug … my beautiful mug … gone forever! Who could have done such a dastardly deed?! Then I spotted it, sitting in the sink. Someone had placed it there, thinking it was dirty. It makes me smile every time I use it. Here’s where you can find one too — masculine pronouns available. Guard it well, my friends.